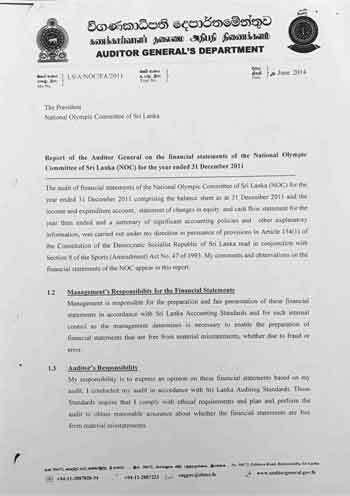 There were serious financial, operational and management discrepancies in the National Olympic Committee of Sri Lanka between 2010 and 2012, reports from the Auditor General’s Department show. The reports should have been ready three months after the end of each financial year. Section 6.1.1. of Treasury Circular No: 01/2004 of February 24, 2004, states that financial statements should be rendered for audit to the Auditor General along with supporting documents within 60 days of the closure of the financial year. But the NOCSL ignored norms and regulations by delaying accounting for monies allocated to it by the International Olympic Committee (IOC) and Sri Lankan taxpayers for the betterment of sports. The NOCSL finally circulated audited accounts for the said period this week, with the election of office bearers just days away (the first elective Annual General Meeting in nine years takes place on February 23). It also attempted to adopt these accounts at an office bearers’ meeting held on Thursday but seven out of the 12 members snubbed the event citing that the financial statements should have been discussed and approved before being sent for auditing. According to the 2010 Audit Report, the Olympic Committee received a sum of US$50,000 as part-payment from an agreed sum of US$60,100 (US$38,400, US$20,545 and US$2,155) from the Olympic Solidarity fund for the preparation of athletes for the Asian Games. However, without distributing it among member associations, the NOCSL has disbursed payments of Rs. 1mn and Rs. 2.5mn to golf and tennis associations while rest of the monies were spent as fees for an Australian coach who reportedly conducted a ‘Mental Toughness Training Programme’, an audit report seen by the Sunday Times says. The NOCSL paid Rs. 2,509,050 and Rs. 623,009 to the foreigner but failed to submit a copy of his employment contract to auditors. One report highlights several instances of non-compliance with Treasury circulars, procurement guidelines and tender procedures in purchase of goods and services worth Rs. 52mn. NOCSL has not appointed tender boards and technical evaluation committees; no formal agreements have been signed; not maintained goods received and stock registers. The purchase of air tickets worth Rs.39mn (Rs38,932,272); expenditure of Rs. 8mn on track kits, shirts, bags and lapel pins; and Rs.1.8mn on purchase of goods and payment for services for the Commonwealth Games are highlighted. A contract to lease out a fitness centre was awarded without tender or executive committee approval which, auditors say, adversely affected the NOCSL’s financial position. They question the transparency of the transaction involving approximately 3,000 square feet of building space and fitness equipment worth of Rs. 20mn for a monthly rental of Rs150,000 or 50 per cent of monthly turnover, whichever is higher. But NOCSL has subsequently not considered the turnover of the center opting to simply collect Rs.150,000 as monthly rental. Even though an annual income of Rs.1.8mn was made during 2010, the maintenance cost and depreciation were three to four times higher than income. NOCSL has carried out several activities such as the National Olympic Academy sessions of the Advanced Sports Management Course in Bandarawela, Sports Administrators Courses, three Sports Medicine Courses without an action plan. Among the management issues, NOCSL has sent a contingent of 21 participants for the Asian Games held in China in 2010 without the approval of the Secretary to the Ministry of Sports. They have also paid a grant of Rs.149,300 to the Sri Lanka Hockey Federation by crossing cancelled checks. It has been revealed in audit that the Hockey Federation had not received this amount up to 31 December 2010. Two credit cards (maximum limit of Rs100,000 and Rs350,000) were continuously operated without proper approval. No action was taken to recover expenses amounting to Rs.760,339 spent for Ministry officials who had attended the Commonwealth games in 2010. Uneconomic transactions mentioned in the audit reports include the supply of 1,650 t-shirts and 530 track kits without calling for tenders or without entering into any agreement. A sum of Rs15,553,000 was paid in four installments as advances, violating the maximum limit of 20% of total contract value in terms of Section 5.5.4 of the Procurement Guidelines 2006. The auditors have also brought to light instances of accountability and good governance being violated. For instance, draft financial statements were not presented for auditing within sixty days of the close of each financial year in keeping with the Treasury circular. The draft accounts for the year ended 2010 were only submitted for audit on April 3, 2012 without being authenticated by the executive committee. The NOCSL failed to maintain cash flow statement and statements of change in equity, the costs of fixed assets and accumulated depreciation shown in the financial statements. The income and expenditure statement of teams sent abroad was not made available for audit as per section 5(b) of Article 14 of the NOCSL. The audit report for the 2011 financial cycle points to an understated amount of Rs.300,000 from hiring out the restaurant. It states that, even though an annual rental of Rs.3.9mn should have been received, only Rs. 3.6mn was accounted for. The contract was first signed for five years starting November 1, 2009, at a monthly rental of Rs. 300,000 in the first year and an increase of Rs.30,000 annually thereafter without following procurement guidelines. This agreement was later canceled in favour of a new five-year contract with another party starting November 1, 2011, at a monthly rental of Rs.300,000 in the first year and Rs.15,000 annual increment thereafter. This caused an estimated loss of Rs. 2.7 million to the NOCSL. The 2012 audit report found the new lessee to be the same as the former lessee. 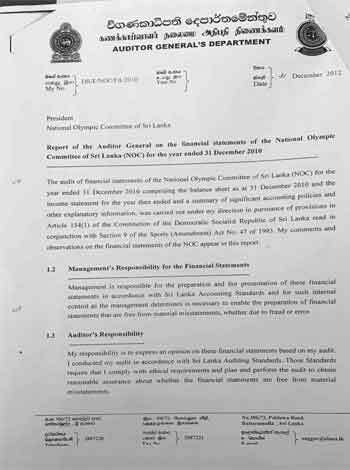 There was lack of evidence for several transactions amounting to Rs.10mn including purchase of t-shirts and track kits for the Commonwealth Youth Games held in Hambantota, purchase of furniture, amounts receivable from the Ministry of Sports and reimbursement of air fair charges. All these were without proper tender procedure. The NOCSL constitution mandates 12 executive committee meetings each year but it has had only four during the year under review. There were serious lapses on the part of the treasurer who did not maintain a copy of the income and expenditure statement, a violation of article 14.5 of the constitution. The NOCSL has also violated Government procurement guidelines by making advance payments exceeding 20 per cent of contract amount on four occasions. It bypassed a Government directive to buy air tickets from State institutions and purchased tickets worth Rs1.74mn from the private sector. Among other transactions of contentious nature is the purchase of a five-year-old reconditioned van from a private company for Rs. 2.6mn against the section 3.2.2 (a) of the Government Procurement Guidelines issued in 2008. The amount was settled by transferring a NOCSL-owned Caravan at Rs. 1,400,000 without a professional valuer’s certification with the balance of Rs. 1,200,000 being settled through a lease despite having sufficient funds in the account. This resulted in a loss of Rs. 455,113 in interest payments on the lease. Despite a Sports Ministry directive to submit a report within ten days of each foreign tour, auditors find that NOCSL has not submitted the same in respect of the 2011 Commonwealth Games on the Isle of Man. Funds amounting to Rs1,350,000 from the IOC for distribution among sports associations was retained by the NOCSL. Bonus payment to employees amounting to Rs 680,984 was paid without executive committee approval. 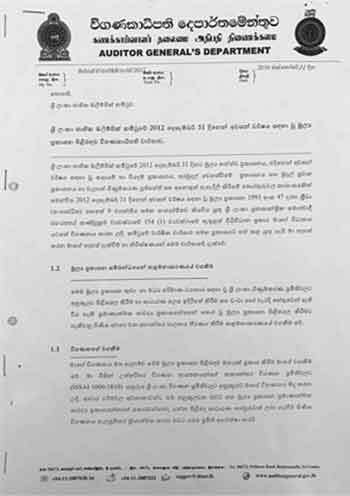 Accounts for the year ending 2011 were presented for audit only in November 2013, nearly two years after deadline. There have been no corporate plans, no action plans, no internal audits and no audit and management committee meetings as required under the Public Enterprise Circulars or Procurement Plans as specified in the National Budget Circular. The 2012 audit report states that the NOCSL received Rs3,125,989 from the IOC for a mental preparation programme for the 2012 London Olympics. This was not used even by December 2015. A further Rs 9,319,076 was received in April 2012 for the NOCSL’s 75th anniversary. One-third of the money went towards administrative expenditure–not the project. The 2012 report mentions several financial deficiencies. Certifications were not made available in respect of bank account balances in local currencies amounting to Rs. 48,647,204 and foreign currency of US$29,547. Accounts receivable from the Olympic Committee of Asia (Rs 8,434,154) and President’s Office (Rs 4,103,478) and 97 journal vouchers amounting to Rs 80,203,147 where approvals and certifications were not made available for audit. Even though NOCSL increased the salaries of its employees by 25 per cent, it has not made EPF contributions amounting to Rs 50,260. Violating Government directives that public employees must travel in economy class, on six different occasions seats were booked in other cabins resulting in an over-expenditure of Rs. 664,811 by officials who claimed to be working in an honorary capacity. A sum of Rs. 195,771 due from two people in respect of tickets for the 2012 London Olympics has been written off without executive committee approval. An amount of Rs.1,330,481 due to the Commonwealth Games Federation for travel of Ministry officials in 2011 to the Isle of Man was paid by the NOCSL in 2014. Due to depreciation, between 2011 and 2014, an amount of Rs. 178,805 had to be borne as extra charges. As in 2010 and 2011, no documents pertaining to letters of appointment, educational qualifications, promotions, etc, have been maintained. Under NOCSL rules, employee loans can only be obtained by those who have served for over two years. But there is a case of an employee of less than six months being granted an interest free loan of Rs150,000. The audited account statements and audit reports from the period from 2013-2016 are yet to be shared among the office bearers.